2016 saw New Diorama unveil our brand new garden rehearsal studio space, named after twice-Camden Mayor, Heather Johnson, built with support from The Theatres' Trust. 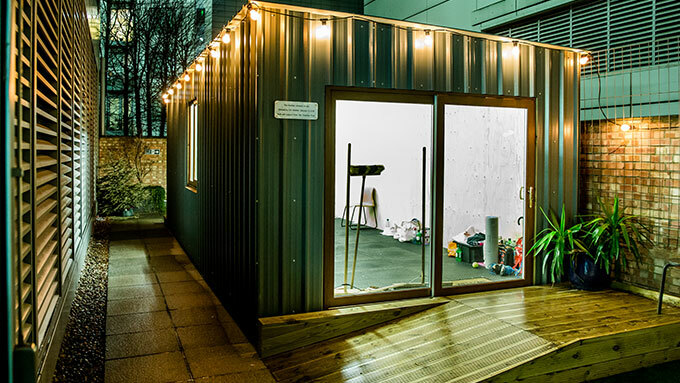 The Heather Johnson Studio is a self contained, fully flexible, light and creative space which serves as the perfect blank canvas for your rehearsal, workshop, classes, meeting or unique event. The space is available for daytime and evening hires. The studio is 8m x 3.5m, fully accesible with abundant natural light, power supply and durable flooring. It is lined with natural pine walling that adds to the light atmposhere of the space. The studio can be accessed independently to the theatre building upon arrangement and also has easy access to the green room facilities in the main building, and the stylish and friendly in-house ND cafe. The main entrance to the studio has a small decking and garden area also. All hires are arranged bespoke to ensure all all enquiries and requirements can be met so please get in touch to discuss your event. For more information please email helen@newdiorama.com or call 0207 383 9036.